Yesterday my BFGF Savannah, of Savannah's Paw Tracks, posted a photo of her Sunday EZ but I noticed that something was amiss. See if you can spot it. You're right. She's on the edge of the bed. I guess she was very comfortable there. My advice to Savvy was to spread herself out and live a little. She shouldn't be afraid to lay smack dab in the middle of the bed and she should plop down on the rumpled sheets. As a good mentor cat would do, I set an example for her. So, BFGF, watch my stunning style. 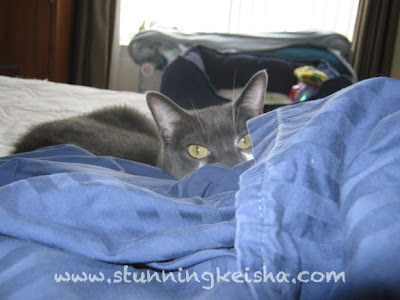 Looking for my prey in the crumpled sheets waiting to be laundered. Ah, a newly made bed and guess who has the best spot. You know where you can stuff that flashy box, Woman! Got my Skinneeez mouse and my crinkle ball and the center of the bed. I don't like to keep axing you to nominate www.stunningkeisha.com for a Petties Award in the Funniest Blog or Blogger category. Begging is not my style. I would like to make the finals to prove that you don't need to be one of the "big guys" to compete; and, maybe next year, some of you will join me. I think many of my furrends are worthy nominees: Forever Homes Wanted and Animal Shelter Volunteer Life for Cause Blogs; Brian's Home and Savannah Paw Tracks are worthy of your nominations, as well as Sparkle and Glogirly. Remember, for every blog you nominate, you can nominate a shelter to win a $10,000 grant. Use your imaginations when you vote. Na mean? Thank you for your support. Tomorrow is the last day to enter the drawing for the $20 NipandBones.com gift card. Everyone is eligible. Post a comment here and tell me you want to be entered. You're exactly right, a cat should take over the whole bed. Humans should dangle over the edges.. Even better, I sleep on my human's boyfriend's pillow and fur it up real good for him. We think you got it sussed Keisha. We agree middle of the bed is best. Have a marvellous Monday. CK, you set the very good example for all the kitties who hesitate to be in the middle of the bed! That is a fine example CK! Hey, I like living on the edge though! The only spot better than the middle of the bed, it the middle of Glogirly's pillow. When she's sleeping on it. Thank you for mentioning us in your Petties call-out...that was very sweet. There are LOTS of deserving blogs and shelters out there. We are nominating every single day! Keisha, Annie is benefitting from your mentoring and is taking notes since she's always in the very corner of the bed. Thank you so very much for visiting us about Simba and leaving your sweet note. Great mentoring, CK. 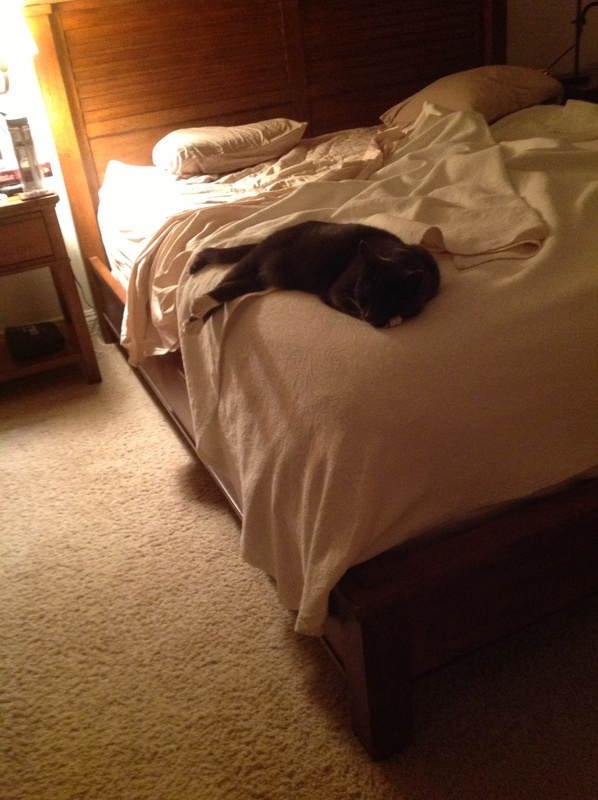 Sprawling across the whole bed is always best. You sure know how to do it, CK! That's true: human beds were made for us anyway! 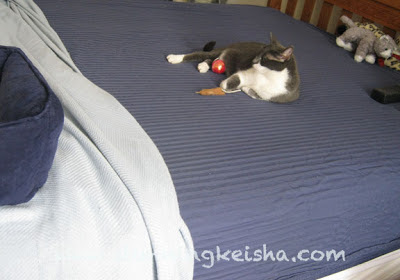 I see you like to take your toyz wif you when you use up the whole bed--it makes a nice playing field, doesn't it? Excellent strategic positioning, CK. The young kitties can always learn a great deal from our floofing out techniques on any surface! Don't forget the fur shedding option for complete satisfaction! I believe in that positioning too. You know me, sweet girl! Push the mom to the very edge and take over the bed. All I have to do is wiggle my toesies in her back and she's toast in my paws. 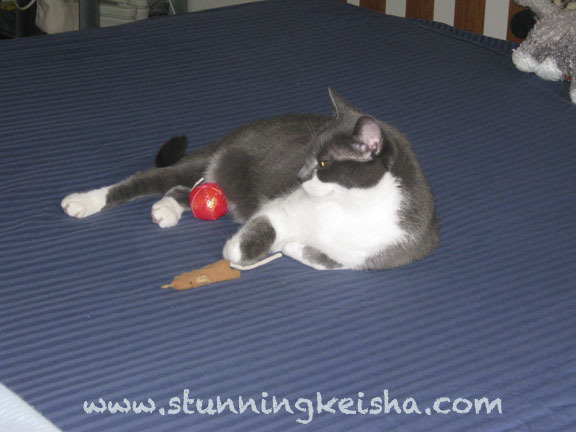 Theese ones are great tips from you CK, and you are looking very stunning on your bed!